Lowdown: James Stewart finds out the hard way that fighting your fears - in his case, vertigo - is not that easy to do, even if you get repeat attempts. 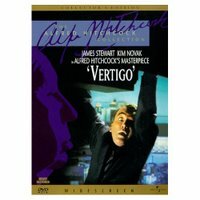 I have bought the DVD of Vertigo's restored version back in 2002. A week after buying it I got a letter telling me I got my visa to Australia, and by the time I received the DVD most of my stuff was packed up and on its way to Australia. It's amazing, given my love of cinema and my admiration for Hitchcock, and the fact I only saw this film from start to finish once and even that was in high school, that I waited so long to watch this film from 1958. So was it worth the wait? I'll say this: It's an excellent film, but it does not stand the test of time as well as others. The story follows James Stewart, who plays a retired police detective traumatized by his vertigo that caused a fellow cup his life while on a San Francisco rooftop chase. He is a bachelor, like his only friend, portrayed by Barbara Bel Geddes (who is most famous for her role of Miss Ellie in the notorious TV series Dallas). Together they try various tricks to help Stewart overcome his fear, but keep on failing. Then Stewart is asked to follow a woman that is behaving very strangely (Kim Novak). He follows her, falls in love with her, but when action time arrives his vertigo strikes back and Novak dies on him. Stewart gets another chance to fight his fears, Miss Ellie gets a chance after chance to let Stewart know that she really loves him, but everyone just cannot overcome their fears and end up doomed by through their own weaknesses. The film is very well done - there's no doubt about it. Hitchcock's direction is probably the best one can ever see as far as creating the setting and the compositions, the use of San Francisco as the film's background, camera setups and editing. 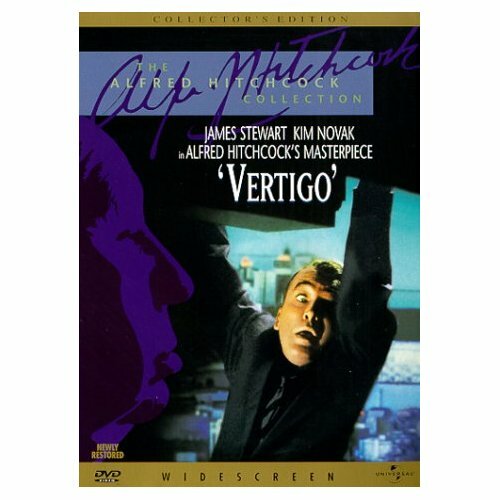 In those aspects, Vertigo is a true work of art. However, I feel the pacing suffers quite a bit with the film tending to border the boring in its slow development, even if Hitchcock is trying to tell us something important in each and every scene. Worse than that, the plot has a few holes in it that no good film of our time will get away with. For example, there's a scene where Novak parks her car, blocking an entire street; and if you watch the end scene (which I won't detail here), you will not be able to avoid asking, "but why?" Still, despite the reservations, the film is an effective thriller with a candid saying about human nature. First and foremost, though, it is a masterpiece of plot progression and message conveying through advanced exploitation of cinematic means. I suspect this is what they use for text books in cinema schools. Best scene: Needless to say, Steward chasing Novak up the stairs while being hit by his vertigo. A classic scene that fully deserves its status. Picture quality: A jihad on all non-anamorphic DVD's! I can't understand how Universal / Paramount allow themselves to release a widescreen DVD and not "enhance it for 16:9 screens". You watch the film and you simply see the poor resolution staring back at you - and for no particular reason. This DVD that I bought from Amazon is actually in NTSC (as opposed to the much superior PAL), so the picture was even worse; but regardless of that, shame on the studios for releasing a "collector's item restored version" DVD while not utilizing the best that the DVD format can deliver. And it's even the industry standard to do so. Sound quality: Sound was surprisingly good. You could hear the date on many of the sound elements, and the soundstage was not as full as many contemporary films can deliver, but on the other hand the music was quite dominant in delivering its message well enough.